Sometimes called Jeruselum crickets or Niñas de la Tierra (children of the earth, in Spanish), these things are huge! I've seen them as big as three inches long. Not the biggest insect in the world, but easily as big as I'd ever want to see. They look like a grotesque clown of a giant ant with huge brown and black striped abdomen. 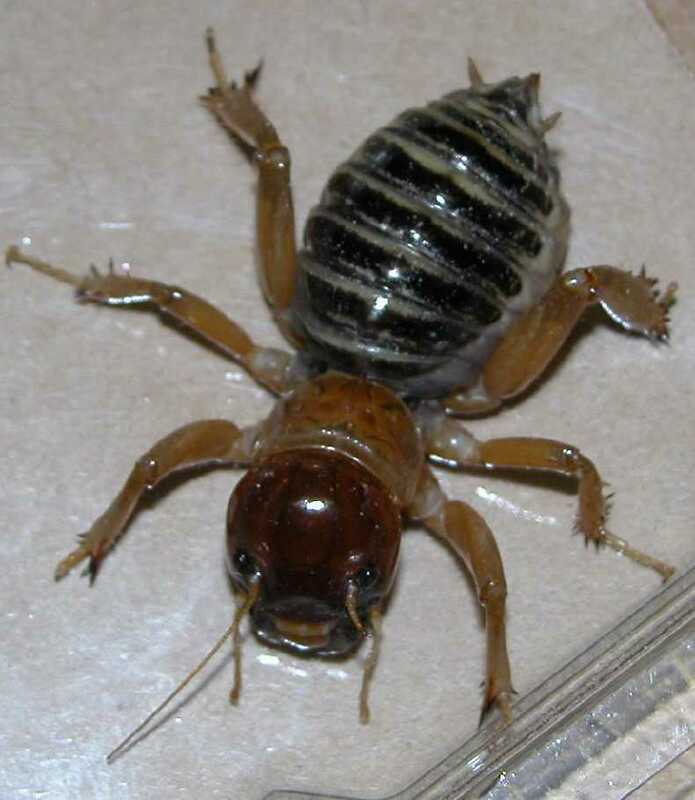 According to all the best bug books(BBB) they are shy, nocturnal, and live underground (this has got to be good for everybody, even the potato bug). They don't eat my plants, or fish, or the cat. They don't come into the house (except to die). They don't eat wood, thank god. They would seem to be entirely harmless. However, I believe these insects would be a serious threat to civilization if they weren't the least lucky of earth's creatures. I have never seen a potato bug that wasn't either dead or mortally wounded. I've found them dead in the drain of the outdoor sink (plugging the drain). There was one, dead in my gardening shoe in the garage, it could have died anywhere but my shoe proved most suitable. I've accidentally killed one while replacing a fence post. I've found them dead in the pond. Killed by the cat-the list is endless- always dead or dying. The natural scientists among us would say that for everyone I find dead there are ten, I never see, that live their entire lives without dying horribly(and inconveniently) for me to find.